Blizzcon 2014 is over, but the legend lives on. N3rdwards, Rankil, and Flux attended this year’s show and bring back stories about the playable D3 demo, play-testing all the new Item Sets and Legendary Items, Diablo 3 panels, cosplay, D3 dev encounters, and more. Plus a special message from Wyatt Cheng at the end! 0:20 — Blizzcon 2014 reflections. N3rdwards’ first Blizzcon ever, and he still has excite post-show. Rankli is an old pro. What it’s like to cram into a building with 25,000 Blizzard gaming fans? 5:05 — Did Project Titan transform into Overwatch? 8:45 — Witnessing Cosplay in person? They really work hard to create eye candy for the rest of us. Early Diablo Podcast with a cosplayer interview. 16:00 — No selfies at Blizzcon?!?! 18:00 — Diablo 3 demo at Blizzcon 2014. Why so easy? What new item or build was most interesting? 26:30 — Why the new Wizard set is the best thing ever, N3rdwards explains. 35:00 — New Barbarian Rend/Whirlwind set and why it doesn’t synergize well. 42:00 — Demon Hunter set and why it rules and what the original idea and how it evolved. Plus Crusader and Witch Doctor. Rankil earns ultimate gamer geek cred by taking his PS4 to Blizzcon. 52:20 — Diablo 3 panels at Blizzcon. Attending is different than watching on TV? New content in panels? Chatting up the devs when they linger after the panels end. Plus all-but confirmations of Diablo III expansion nearing completion and why less Diablo III content this year is better news long term. 1:01:20 — Storytime with Wyatt Cheng, and other developer interactions. Photo here. 1:15:00 — Final thoughts on Blizzcon 2014, eager for PTR and Blizzcon 2015, which should focus much more on Diablo 3 with the next expansion already announced. 1:21:30 — Special bonus 90 seconds with Wyatt Cheng, recorded Saturday night just as “Story time with Wyatt” and Blizzcon 2014 came to an end. Doesn’t expansion announcement requires a headline?!? It’s All-But. It would not be the first time a big rumor makes a headline on this site. You can find Ancient items of sub-par items so you can finally make a build around those items? Why not just buff/fix those sub-par items to make them always useful?? They are, gradually. But if everything was buffed to identical levels, then the AI would still be upgrade as you found them. The concept of AI is to provide another tier of better gear for gradual upgrades. The devs feel that players enjoy the game best when they are regularly finding better gear and improving their kit. But with item drop rates so high now, a busy player can find a whole new 6 piece set in a few days. AI are meant to stagger that progression a bit and to make item hunting fun even for players who are super geared out already. Ooh, what has changed about the map? Not seen anything myself unless it’s from a patch preview? I find it hard to believe I’m the only one who spotted this o.0 yet can’t find any other images of the new map. That’s not a new map. That’s the same version that’s been used since at least the release of Book Of Cain. Skovos and Xiansai have always been labelled on it. 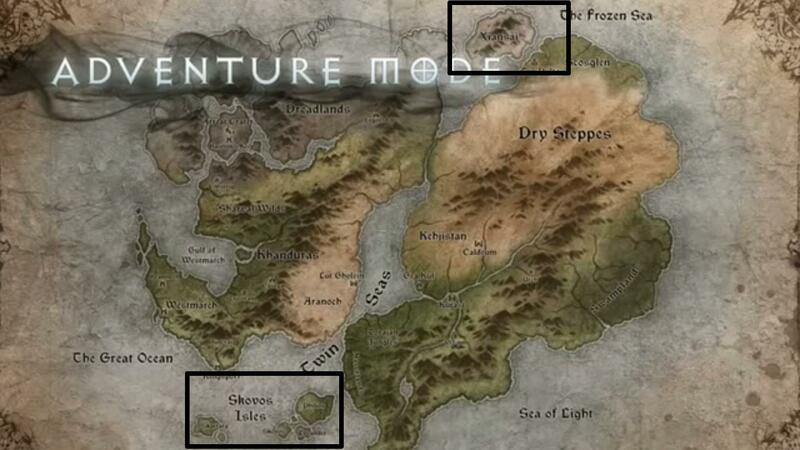 I’m torn between Skovos or Xiansai as the next major location we visit in game. I’d love Skovos but apart from Tyrael’s mention in adventure mode, I can’t recall where else it comes up in game. Xiansai on the other hand is mentioned quite a bit by Shen and the wizards come from there. Given Westmarch was referenced quite a bit in vanilla & that became Act 5 I think we may be going there next (& the adventure mode reference to Skovos is a red herring.) Could be way over thinking about this though! I’d be interested to hear what you think and where you’d like to visit in Act 6? One is the Amazon homeworld, one is the Wizard homeworld. I’d like to visit both and we probably will. I think there’s a few things they could introduce to Skovos. The end of RoS strongly hints at the nephalem being susceptible to corruption and how that could doom all of creation. We could be seeing a storyline revolving around a nephalem war brewing with one of the Skovos islands being their base of command. Also in death Adria announces Diablo’s return and his soul is released in Malthael’s death. It is likely that we will face him again, maybe as Tathamet in the burning hells. Finally the last we knew of inarius, the creator of sanctuary, he is still in the burning hells being tortured. I could see our father seeking vengeance on everything after all that time. By extension Lilith could show up again too, perhaps puppeteering the nephalem. just think it’s cool to have a personal connection. IncGamers is devoted and it’s cool for ‘Blizzard’ to acknowledge that. Did they ever discuss anything about Diablo: Sword of Wisdom that was leaked months ago? Or was that a hoax? Excellent episode and BlizzCon recap. I WILL be there with you all next year.